This was the last time that we had planned to visit Charlton House, the reason for this is simple, the start time of the event is too late and the Management won’t let us start earlier. We were hoping for a good ghost hunt and it was another excellent night. All groups in the séance sessions felt the resident spirits move or touch them. Some of the movements especially with the third group were pulling us towards the floor, why this is so common we have no idea but there must be a reason otherwise spirit wouldn’t do it. Have of the session I held a séance the half of the time I was introducing the guests to certain electronic gadgets and kit that we use. Many guests had useful communication via a spirit box including saying the guests’ names, which was scary to some of them. This was an enjoyable ghost hunt and one in which all the guests had some form a paranormal encounter, either from using the gadgets or from the séances. We would like to return but until the event times are earlier this will not be possible. I started the session by asking the group what activity they would like to participate in first. Many of the group didn’t want to take part in the Ouija so I stared them on the table tipping first. Initially the table only started by gently rocking slowly from side to side. I kept encouraging spirit to try harder and move the table in another way for us. Eventually the table began to tip up on to its side, and with the guests also encouraging spirit the table spun round for us. At this point Miraj (guest) asked spirit if they could possibly walk the table into the other room, it promptly did so and took the table to an old school desk and kept rocking the table up against the desk. It was decided then that we ask spirit through the table some questions. Saying to spirit to tip the table to right for a yes answer and left for a no answer, we asked whether the old school desk had played a significant part in their life. The table however just kept banging against the table. Meanwhile Andy and Lewis (guests) had started on the Ouija. Movement was initially very slow to start, but at this point we all sensed the spirits of children around us. I and another guest joined the table and a spirit of a young boy came through stating that he was 6 years old. Still encouraging this spirit to communicate we sadly didn’t get anymore movement from the glass. Just as the session was about to finish, Andy’s that was sitting on the table turned itself on and the door with some force came open by itself scaring us all at the point. Before the start of this session, I had taken a small plastic teddy bear up to the room to use as a trigger object because all guests in group B had sensed small children. I pointed out to the group the trigger object, and we asked spirit to see if they could move the teddy during our session. As there were only five people in this group, it was decided that they all wanted to start the session on the table tipping. I pointed out the group the trigger object, and we asked spirit to see if they could move the teddy during our session. To the groups amazement the table started to move straight away. Encouragement from the whole group at this stage asking spirit to move the table in some way, it went up on to one left and held this position. We all kept encouraging spirit to move the table again or in some other way, and it was at this point Stacey (guest) broke down and started to cry uncontrollably saying she felt so emotional. After a while the table suddenly went up on to one leg and rotated clockwise, then tipped on to the other leg and rotated anti-clockwise. The table then did the same thing as happened in the first session. It began walking towards the door and out into the other room and straight to the same old school desk and promptly stopped. Asking spirit again if this desk had meant something to them Naomi (guest) opened the desk and written in capital letters on the inside of the lid of the desk was the word yes. Well I guess this answered our question, and also from the first session. At this point Richard (guest) started to feel sick with pains in his side. I suggested he leave the table as he said he also started to feel really aggressive. We all then moved on to the Ouija. Asking spirit to communicate with us through the glass, it stared spinning in big circle on the table just to build up the energy. A spirit came forward and told us she was a young girl by the name of Sarah. The glass stopped at this point and to our amazement the table began to tip instead. This was a much bigger table and we could believe this was happening. 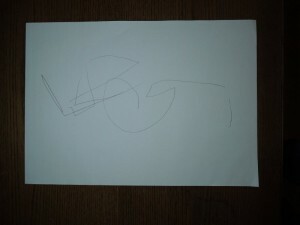 Autumn (guest) said she heard footsteps moving amongst the desks. We called out to spirit to make the noise again, and this time we all heard it, like children running around the desks. Stacey (guest) then pointed out to us that the bear had moved. It had been turned to face the other way. Nobody in the group could have done this as we all stayed together during the session. We started this session again on the table tipping. Initially the table didn’t move. However, with some encouragement from the group the table began to move gently and then stopped. At this point all the guests started to sway back and forth some experiencing pins and needles sensations in their arms. I asked spirit politely to take this feeling away and if possible to move the table in some way. The table again started to gently rock from side to side and then suddenly it tipped up on to one leg and start to spin around in a clockwise direction. To the guests surprise the table then began carrying out erratic movements that none of the guests could keep up with. We the moved on to the Ouija with some guests watching as they didn’t want to participate and said they were more than happy to watch. We were joined by the spirit of a young girl named Sarah who I would assume was the same spirit as in the second session. She went on to tell us that she was seven years old and that she was scared of the man that was in the room with us. One of the guests asked if this spirit was a teacher to which she replied yes and that he used to treat her badly during school always telling her off. During the free session Stacey and Naomi asked me if I would join them back on the Ouija board to see if they could get back in touch with Sarah. The glass began to move around the table but unfortunately we were unable to communicate with spirit. However during this period we heard what sounded like a child giggling and footsteps again. When we went to investigate the bear I had previously used as a trigger object had moved to the other side of the room on a different table. I know that no-one had been in that room since the last session and before leaving I checked the bear and it had remained in the same place as I had left it. This was a very good venue to investigate and all the guests enjoyed the sessions. 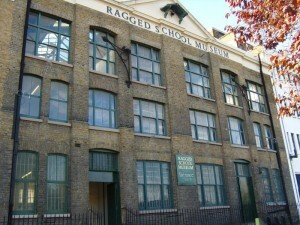 I hope in the future we do revisit the Ragged School Museum as I think it has a lot more secrets to be uncovered. Group C – This was a new area for us to work in, we had ventured into this area in the free session before, but it was a great opportunity to experience this place more. We started by using the dowsing rods & pendulums, many had used these before, and had visited this venue before. Two female guests were communicating with a female spirit, her husband and a son. They were feeling them too by the static energies moving around them. They were also sensing a small girl too. They were hearing tapping, and when asking spirit to repeat, they would hear it again. We then started using the equipment, no activity all night on the KII’s, but a lot of communication with the Ghost Pro’s. Some were experiencing headaches, and feeling sick in a certain room. On the Ovilus when asking spirit his name we got Paul, when asking if that was his name we got “rewind”. Seemed quite apt. Group A – Started with the rods & pendulums, and guests went off to explore the area communicating with spirit. I also handed out kit for the guests to use. Jo (guest) wanted to know the name of the spirit she was communicating with, and as I often say we are all receptive to spirit communication if we allow, so I left her on her own for a short while, asking spirit their name, and she had two names given to her in her head: Michael & Sam. 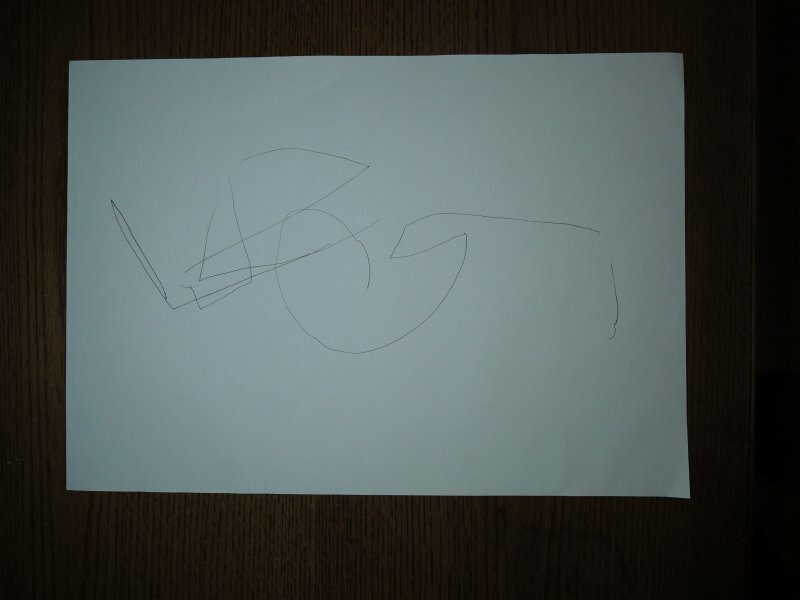 We asked the ghost pro if Michael was his name, and it answered yes. Asked a few more questions; Michael had lived here, he didn’t own the house, but his family did. Then a different spirit started communicating with us on the ghost pro, I suggested Jo ask if it was Sam, and answered yes. He was the brother of Michael. We asked how old Sam was, and the Ovilus answered “six”. Whilst we were all standing at the top of the stairs, we all heard a loud bang in one of the rooms behind us. This was the door to the roof, but checking, it was securely closed. We continued to communicate with Sam, and I felt a touch on my leg. I then felt a touch & coldness to my right hand, asking for Sam to touch Jo she immediately felt a coldness on her hand, and a tug on her little finger. Group B – Again we started by using the rods & pendulums, and most had spirit communication. Female & male spirits. One guest had the name “Sam Moore” in her head. Guests were feeling cold areas around them. They were also being touched and pushed. Someone felt her arm being moved up whilst holding the dowsing rods. Whilst we were all standing at the top of the stairs, we asked the spirit to touch us, and two guests felt a cold touch on their thighs, in the same place at the same time. An interesting area, and when entering at the start of the evening on my own I had the feeling of being watched, sensing there were many that wanted to communicate with us. We were not disappointed. 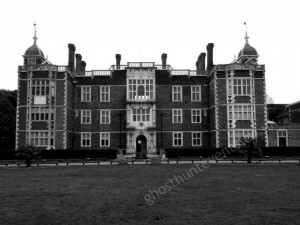 We have investigated Charlton House on a number of occasions and it is safe to say that we know that it is haunted and have many reoccurring incidents in various rooms of the house. However every time we go there I try to investigate a different area or room and move the team around so that they can experience the different spirit energies. This time around I chose the Library for my séance sessions and several spirits came to join us. We were joined in the first session by an Army Captain from the First World War, he didn’t give me his name but he was aged in his mid-30s. There was also a Priest present who was from a much later time period but he was not a happy fellow, but we really never discovered why he was so unhappy. Various noises were heard within the room as well as people feeling their arms tingle and move, some people also felt cold spots that came and went but not consistent with a draft. The second session we were joined by Dave a soldier also from the First World War, Dave was able to manipulate people much more than in the first session, with people being twisted and their legs moved, sometimes against their wishes. Strange an odd noises were heard throughout this session some of the noises sounded like people walking on the upper mezzanine floor. The third session we were once again joined by the Priest who was aged in his late-60s, this time around he was able to push and sway people by moving their arms. We were also joined by another soldier called Lincoln who was only able to make people feel tingly and slightly dizzy. Since we have been to this venue before I decided to move the team around and for different activities to take place in different rooms. This time around I used the Library for my séance sessions. I joined Wayne & Paula for their first session in rooms that used to be bedrooms. I pointed out at various times the spirit who I could see, the first one was a stocky chap who was called Antony who was a Rose gardener and he wore a green shirt or top and light brown trousers. Wayne could sense someone in the doorway but did not know who it was. Also when three people left the room with Paula I noticed that there were two nurses, both dressed in World War One uniforms chatting in the corridor, neither seemed to be interested in what we were doing. The first group to the Library we started a séance on the lower level and we were joined almost immediately by a strict looking Edwardian gentleman who turned out to be a banker. He was wearing a smart three piece pin stripe suit and a top hat. Whilst he didn’t give me his name he looked to be in his late 50s. As I said at the time, he looked like the bankers from the film Mary Poppins. The was also an old couple, walking hand in hand down the side of the room holding a small bunch of flowers, both looked to be in their 70s and the man called his wife Agatha. They looked to be on their way to church or to place flowers at a grave side. They did not interact with us. During the séance we all heard a number of clicks and bangs within the room, one of the guests suggested that this might have been materials of the building cooling down after a hot day, although this sound was not heard by the following group. We also heard footfalls on the upper level but the sounds were not heard by everyone in the same direction. There were a few arm movements during the first séance and some swinging of arms, this was a soldier from the First World War who was responsible for these movements although he tired quickly and the group did not encourage him to do anything. After everyone had explored the upper level we held another séance this time sitting down and although no movement was felt by anyone it did increase the energy in the room as we heard a lot more odd noises and towards the end of the session we all clearly heard a noise that sounded like a cane being tapped on the wooden floor twice. The second group to the Library we started a séance more or less in the same spot as the first and quite quickly people around the circle started to feel pressure on their arms and hands, but more noticeably on their backs and legs. Some people were swaying uncontrollably, others being forced towards the floor. It seemed that those in a certain spot felt the activity greater than the rest of the guests and some of those who were being moved also felt cold spots and a general coldness (this was on a hot day where the air temperature was 26-28 degrees Celsius in the day and 17 degrees at night). During the séance we all heard noises that sounded like footfalls on the upper level, these were in different areas to the first group and these noises sounded more complete, like proper footsteps rather than the sound of just one, like something had been dropped. Several people had their arms moved by spirit too and swayed as there were children spirit about, although I did not see these, but other people in the group could sense them. A few times the circle of people moved clockwise so that everyone could feel the spot where it was colder and where movement seemed to occur. This was another excellent ghost hunt with lots of paranormal activity experienced by everyone. We look forward to returning later in the year. Group B – We started by using the dowsing rods & pendulums, and each person had lots of movement from the start, we were also hearing noises near us, but couldn’t ascertain what. We asked spirit to point the rods to where the spirit was standing and they pointed towards where the noise came from. We explored the area for short while, and whilst all standing in one area we heard a male breath next to us twice, asking the rods to point where the spirit was standing, they pointed towards where we heard the noise. We tried the writing planchette and had some gentle movement at first, then the planchette started moving in a very fast circular pattern, changing direction and speed when asked. The planchette would lift up on the corners too. We asked spirit to move the planchette to places on the paper to indicate yes & no, and was able to answer a few questions. 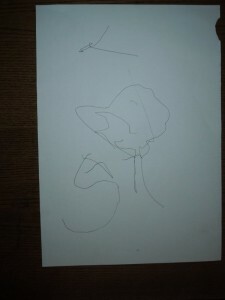 He was male and drew the number 8 for his age. But we felt the energy was too strong for a boy. Group C – Started with rods & pendulums, and all were moving. Asking questions we had a male and female spirit. Rods again all pointed to where we felt the spirit(s) were. With the writing planchette we had again random circles, and when requesting spirit to show the planchette a yes & no, confirmed a child again. Were feeling cold touches on our hands when touching the planchette. We kept hearing noises, similar to someone walking over a metal manhole cover. In a different part of the cellar there is an air event to outside, unsure what was on the outside though. However, we did feel the noise came from near us, and there were manhole covers in the cellar. I walked with one guest to a different part of the cellar and we felt extreme cold next to us, but this was not near the outside vent. Then after a short while it moved away from both of us. Group D – Using the rods & pendulums we picked up again on a male & female spirit, and again after a short while all guests went to explore the area. With the writing planchette the movement was alot more gentle. We asked spirit to draw the number of guests touching the planchette – it was four – and the number 4 was drawn. With another guest (not on the table) drawing a shape on paper, we asked spirit to copy it, with the guests touching the planchette not seeing what was drawn. It was a circle in a square, however only a circle was drawn. Tried again with a triangle, but planchette just drew lots of random circles, etc. Guests tried with just touching the planchette with pinkies and it continued drawing all over the paper. The planchette also kept lifting up many times too. Group A – Started with rods & pendulums, and again a male & female spirit were with us. Louise (guest) went to sit in a small area that had stairs going to no-where. She started feeling very sad, wanting to cry. They were picking up on a male spirit that had raped women. All went to explore, and two guests came running back as they heard footsteps behind them but no-one there. Julie (guest) went to check and she heard the footsteps behind her, again no-one there. We tried the writing planchette and it started moving. Didn’t receive anything legible, except lots of random writing. With the controlled sessions finished, all guests and team went to explore the whole building. Initially I went with some guests and team to the loft, although spirit were present, I felt there were too many people there to get any evidence. I then went to some upstairs rooms and watched some table tipping. The table was moving alot, and we asked spirit to take the table back to Jo (team), who had been in that room earlier. She was downstairs, and although spirit did try to ‘walk’ the table down the stairs, the steps were too slippery so the table ‘walked’ to the lift! After coming out of the lift, the table was promptly ‘walked’ to Jo! I then joined some guests in the library, and noticing a chair standing randomly in the middle of the room, I asked if the guests wanted to try ‘moving’ the chair. We stood and kneeled around the chair and immediately it started rocking, very gently. With the chair being padded and on a higly polished floor, we all felt it was impossible for anyone to make it happen. Then we asked spirit to slide the table, and twice it did just that! Again a fab night at Charlton House – looking forward to the next one! This was our first visit to this amazing location and I was very impressed by the beauty of this magnificent building. I was based in the library which had formerly been a chapel. We started our vigil in the downstairs part of the library. We could immediately sense the presence of a spirit gentleman who was stood watching us from the back of the room. He had a stern personality and was approx 56years of age. We started by using the Ouija board but only had a little movement on the glass. Our sprit gentleman was causing the ghost pro to light up red but he wasn’t willing to answer any of our questions. Both a female guest and myself see at the same time, a female spirit run across the length of the upstairs room on the left hand side. This female spirit was approx 23yrs old with long blond hair, she was wearing a long dress and seemed as if she was running from someone but who it was she was running from we never established. We decided to move upstairs and try some table tipping. The table moved the whole length of the library but glided rather than spun. Through out the night the table continued to move and was very active. The ghost pros continued to flash to red and we did get answers to some of our questions. The thing that got us most was the extreme temperature changes. Even when stood in front of the radiator that was ON we kept getting cold spots and a lot of the guests were getting cold breezes across their face and hands. We felt as if we were being watched again but as soon as we went upstairs it felt like the spirits had gone downstairs and when we were downstairs it was as if the spirits had gone upstairs. For the final 15 minutes we decided to go back downstairs and all spread out on the chairs. I began calling out and asking spirit to interact with us and make a noise. We heard several loud noises. The sound of a loud tin/metal sound but we couldn’t find anything in the room that had possibly made this noise. A chair sounded like it had been dragged and did actually move slightly. A lot of the guests were getting tingling in their hands and fingers and one female guest said she had been pushed in the back. For some reason all the men said they felt quite and subdued but they couldn’t explain why they felt like this but everyone was aware they were being watched. My team member Carl joined us for our second vigil. We started off downstairs with the Ouija board and the glass began to move straight away and also the ghost pro light up red to indicate spirit was with us. A guest and I could smell a chemical type smell and also smelt a sick smell. Shortly afterwards we began talking via the Ouija board to a nurse called Anne she wouldn’t give us her age. Anne said she had been a nurse here in 1942, Anne never had any children but she had been raped by a gentleman called Jack Parr who was 28yrs old. The guests kept looking over their shoulder to the far end of the room. It was the gentleman spirit from the 1st vigil staring at us. We went upstairs and the guests did some table tipping. I had moved the table into the larger space at the far end. The table did not move as quickly as it had on the first session but it gently rocked from side to side. The table tipping continued with some good results. Some of the guests that were not doing table tipping were looking over the balcony to the downstairs part of the room and said they felt like someone downstairs was watching us. We all moved downstairs but Carl (team) stayed upstairs so he could film us by putting camera on the balcony and looking down at us. We all took a seat downstairs and began calling out to spirit. We heard footsteps several times and a noise came from upstairs behind Carl. A female guest screamed as she had looked round and thought she had seen someone sitting next to her. Another guest said she had seen a shadow of a man. As Carl came down the stairs we all heard footsteps behind him. Again everyone said they had the feeling of being watched. Several female guests said they had been touched on the hand or had tingling sensations and also people noticed the sudden temperature changes. My team member Kerry joined us for the 3rd session. Again we started on the Ouija and straight away the spirits were communicating with us on the board and answering our questions. One female guest felt very light-headed and sick and had to move away from the Ouija and a male guest suddenly got a nose bleed. We decided as some guests were being affected we would go upstairs and do table tipping and Kerry remained downstairs with the other guests and continued on the Ouija board as they was getting good information. Upstairs five guests were having very good results with the table tipping and spinning and moving from one end of the room to the other. Three male guests asked to use the bigger heavy table to see if the same thing would happen. All five guests started using the bigger heavier table and the results were the same with the table moving etc. The three male guests were not convinced that the table moving was real, so I suggested that just the three of them take the table to the opposite end of the room and try it with just the three of them. Kerry stayed with the remaining guests and they were also having great results with the table. I and the three male guests went to the opposite end of the room and to the guests amazement the table moved in the same way as it had before with just the three of them on it. I was stood their just shinning my torch so they could see where they were going. They were shocked and said “how can that happen?” “We must do something to the table to make it happen”. I said would you like me to go away and leave them alone, they said that they would like this. So I moved to the opposite end of the room. Within a few minutes I could hear their table being moved, so I shouted out is your table moving? They shouted back “yes we can’t believe it”. I went back to the three male guests and they said “how is it possible?” They turned the table upside down put their torches on and looked all over the table to see if they was anything we attach to the table to make it move. Obviously they couldn’t find anything attached and they asked what kind of table was it, to which I replied it’s a table that’s £9.99 from Argos! The other guests were all having a good time but the session had come to an end. It was now free time and the guests can now explore anywhere they like in the building and have full use of our equipment. The three male guests that had not been convinced by the table tipping asked if they could use a different table and see what would happen. I gave them a different table and they went off to a different part of the building. I later caught up with them and they were in a different room with just of the three of them table tipping. They were now convinced that table tipping is real and does really happen and were quite amazed. I explored the long room and several other rooms including the basement. Charlton house is a huge beautiful building. I cannot wait to come back as I feel there is a lot more to be discovered. So many noises have been heard through out the night and the constant feeling of being watched and sudden temperature changes. The young lady I see running who or what was she running from? I cannot wait to come back and find out. Special Thanks to all the guests.